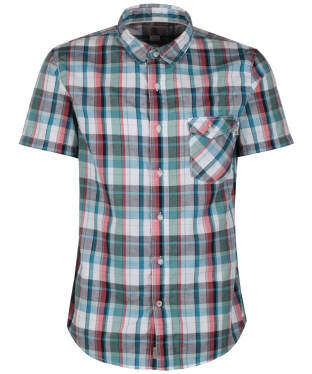 Discover our full selection of short sleeved shirts on special offer right here! 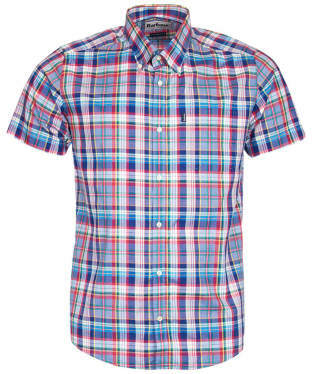 From a simple plain shirt to a bold and colourful check you will find something to suit your style. This section is bursting full of colour and style, perfect for when the days hot up, or packed into your holiday wardrobe. With a range of fits from relaxed to slim fitting and shirts with or without button down collars we are sure you will find something to suit your style. 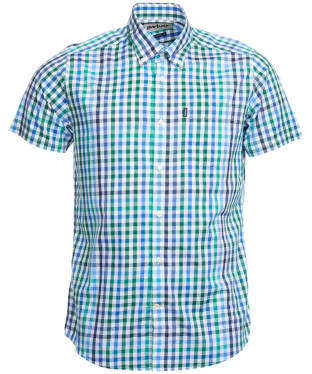 Perfect for pairing with your favourite Timberland jeans, shorts or chinos, the Men's Timberland Suncook River Small Gingham Shirt features a gingham check design that is sure to keep you on-trend through this season and beyond! 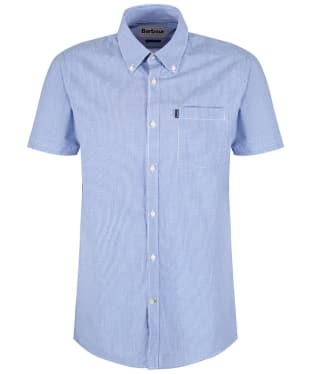 The short sleeved shirt is ideal for when the weather gets warmer, with a button down collar and chest pocket for that smart, classic feel that you are sure to love. 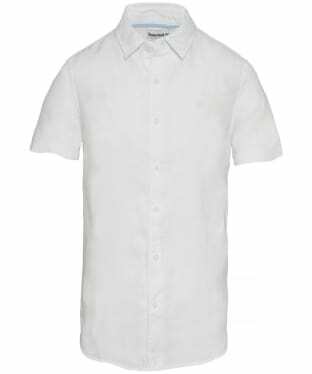 The super soft 100% cotton shirt has been tailored to a slim fit, cut to fit close to the body, creating a fashion forward look. 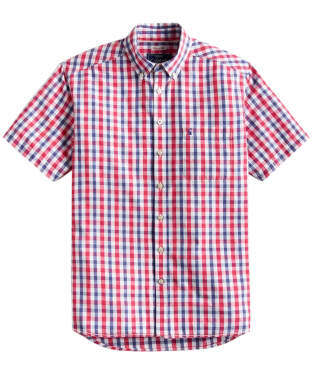 For that added touch of quality and style, the Suncook River Small Gingham Shirt is finished with signature Timberland flag branding to the pocket. 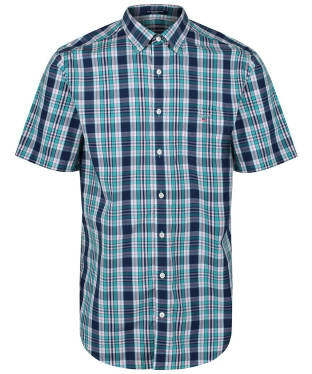 The Men's Barbour Hawnby Check Shirt features short sleeves, perfect for pairing with your favourite Barbour jeans, chinos or shorts, to complete your stylish look ideal for when the weather gets warmer! Crafted from 100% cotton, you are sure to love the soft and comfortable feel of the Hawnby, featuring a fashion forward check design that is sure to keep you on-trend through this season and beyond. The Men's R.M. 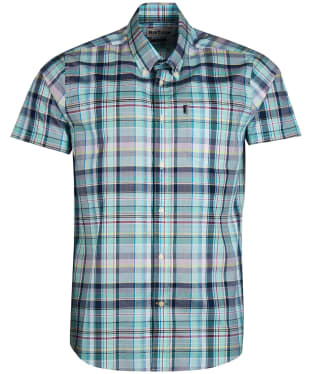 Williams Fraser Shirt is perfect for completing your smart casual look when the warmer weather arrives. Constructed from 100% cotton, the soft, breathable feel of the shirt will ensure that you are comfortable no matter what the occasion. 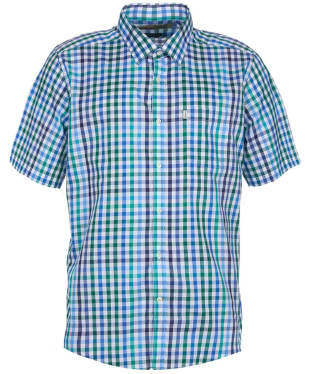 Designed with two front pockets to the chest for that added touch of classic styling and practicality, the shirt boasts an authentic all over check pattern, sure to keep you looking stylish through this season and beyond. Finished with R.M. 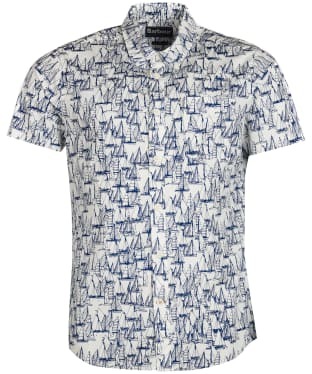 Williams Longhorn embroidered branding for that quality feel, pair the Fraser Shirt with your favourite R.M. Williams jeans or chinos for a stylish look that you are sure to love. 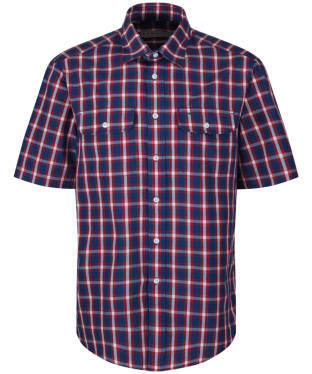 Ideal for the warmer weather, the Barbour Barge Short Sleeved Shirt is a soft, 100% cotton shirt with a country check finish. 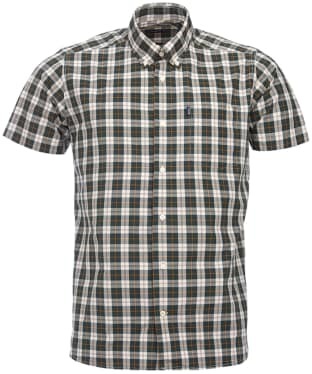 This short sleeved Barbour shirt features a button down collar, and a single chest pocket which is enlivened with a Barbour logo label. This shirt is cut to a tailored fit, which means it will skim over the shoulders and fit neatly around the biceps, flattering all shapes and sizes. 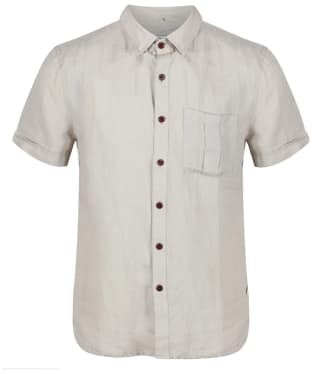 Perfect for summer, Aigle's Rusty short sleeved linen shirt is tailored specifically to enhance the outline of the body, giving a fresh, modern look. The Aigle Rusty shirt also features adjustable sleeves to allow for extra comfort and an even better fit. Made from 100% linen, this lightweight offering from Aigle's summer collection also features a simple yet practical patch pocket. 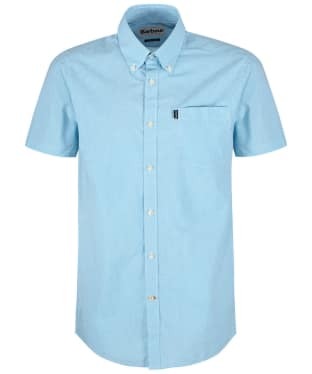 Understated colours and corozo buttons give a cool, natural look: perfect for relaxing when the weather heats up. 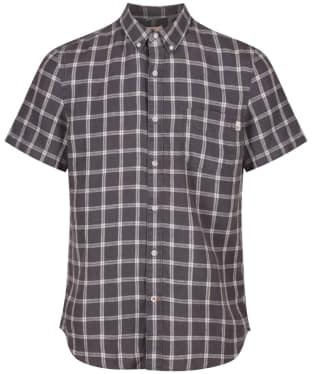 Ideal for those off duty days, the Men's Barbour Rowlock Short Sleeve Shirt has been crafted from a cotton blend, offering you a soft comfortable feel suitable for all day wear. 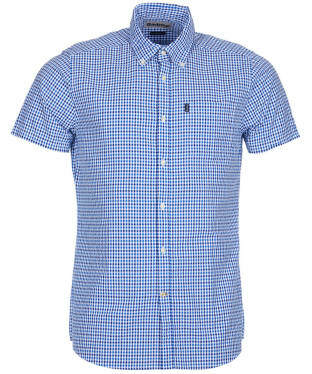 Boasting a striped design and a concealed button collar, the shirt has a neat finish and is cut to a tailored fit for a contemporary look. 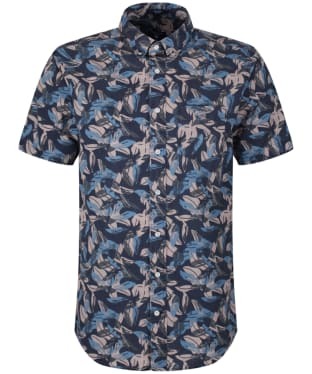 Pair this with a pair of Barbour shorts or chinos and you will be at the fashion forefront when out with your friends and family this season. 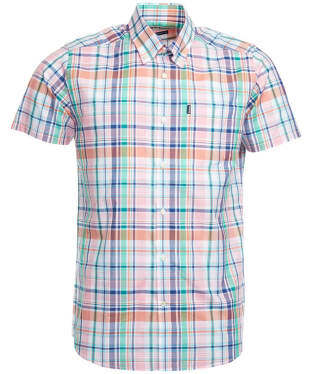 Perfect for when the warmer days arrive, the Men's Timberland Mill River Madras Shirt has been crafted from a super soft linen and cotton mix, ideal for those walks in the sunshine or evenings spent relaxing outdoors. 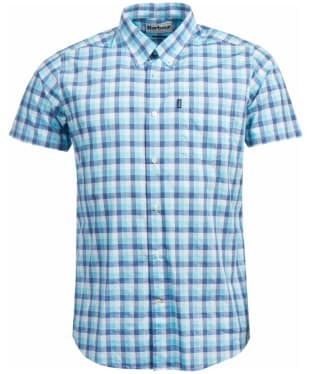 The mini collar, short sleeves and button up front fasten offer a classic style that has been stylishly updated with a Timberland check design, to keep you smart and on-trend no matter what the occasion! Tailored to a slim fit, the shirt will fit close to the body, and neatly around the chest, shoulders and arms for a fashion forward feel that you are sure to love. Finished with signature Timberland branding, pair the Shirt with your favourite Timberland shorts or jeans for a casual look, essential for your suitcase! The Men's Timberland Mill River Linen Shirt has been designed with a button down collar, and button up front fasten for a classic style that will keep you smart no matter what the occasion. Crafted from 100% linen, the shirt is extremely lightweight and breathable, and will keep you comfortable all day long, making it the perfect choice for packing in your suitcase for those days spent in warmer destinations! Cut to a slim fit, the shirt will fit close to the body for a stylish silhouette and is finished with Timberlands signature tree embroidered branding for that fashion forward, quality feel. 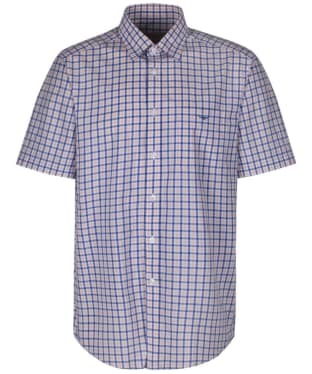 Sure to keep you looking smart, the Men's Timberland Pleasant River Oxford Shirt is a versatile piece, perfect for pairing with your favourite Timberland, jeans shorts or chinos for looks that will keep you on-trend to matter what the occasion! 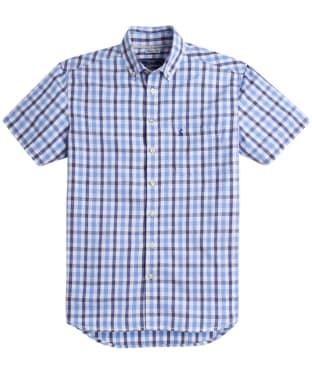 The super soft 100% cotton shirt is super soft and comfortable to wear, with a button down collar, chest pocket and button up front fasten offering that classic feel and neat finish. Finished with a Timberland branded flag label to the pocket for that added mark of quality and style, the Pleasant River Oxford Shirt is sure to be your new favourite piece! Perfect for your summer holiday, the GANT Short Sleeved Airy Leaves Shirt features a bold leaf print in a subtle and summery colour palette. 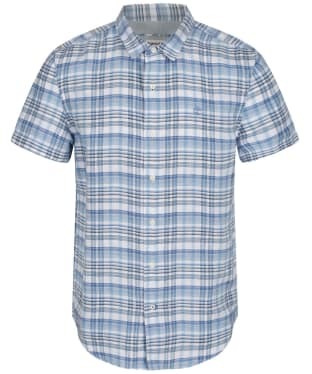 A button down collar offers a neat finish, while the 100% cotton construction is ideal for keeping you cool and comfortable in warmer climates. 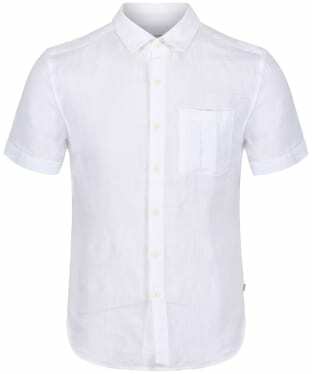 The Short Sleeved Airy Leaves Shirt is finished with a singular patch pocket and the signature GANT embroidered logo. 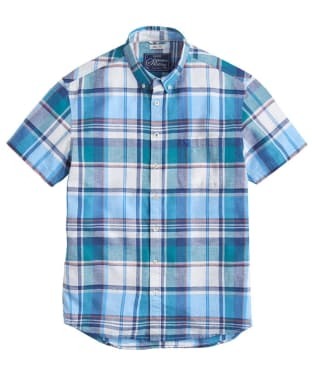 Cut to a regular fit, this GANT shirt will flatter all shapes and sizes. 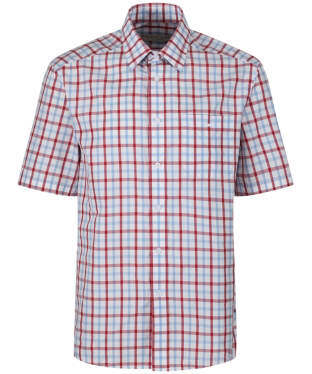 The Men's Timberland Mill River Line Check Shirt is the perfect companion for those smart, casual days this season and beyond, crafted from 100% linen for a lightweight and breathable design. 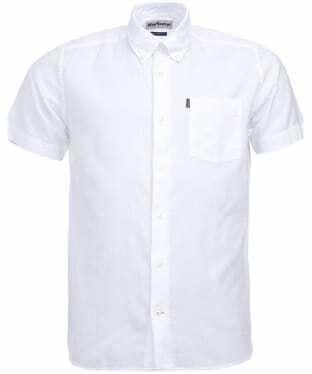 The button down collar is ideal for keeping your style looking smart with a structured neckline. 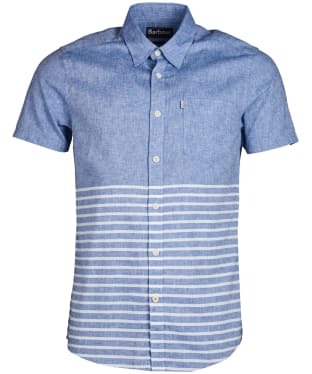 The Mill River is ideal for teaming with shorts or chinos to complete your summer look with stylish ease. The faux horn button detailing gives you a stylish finish you are sure to love! 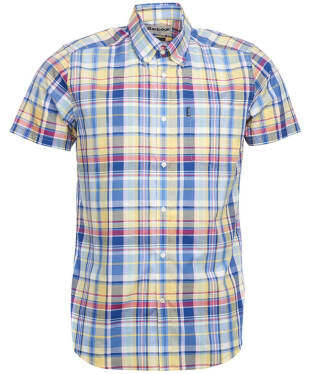 Great for the summer time, this cool and stylish Joules Wilson Linen Shirt is a check print short sleeved shirt with a neat button down collar for that classic finish. 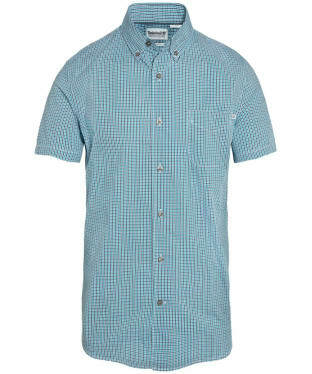 With a check design in a light summer colour palette, you won't head off on holiday without the Wilson Shirt! 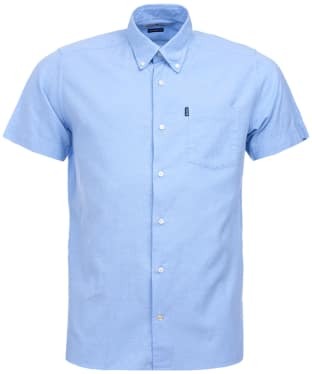 Crafted from a blend of comfortable cotton and cool linen, this Joules shirt is ideal for the warmer weather, and is finished with a convenient patch pocket to the chest – perfect for the passport! 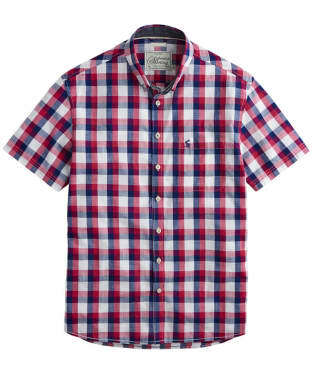 Enjoy the summer months in this cool and comfortable Joules Wilson Shirt; the short sleeved design and lightweight 100% cotton construction means you can easily catch a few rays while staying stylish with the easy-to-wear check print. 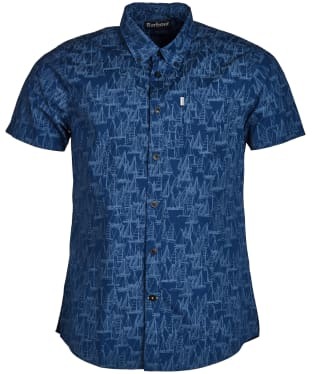 The Wilson shirt is cut to a classic fit, meaning it is flattering on all a shapes and sizes, and will look great worn open layered over a simple white tee for a relaxed summer look. 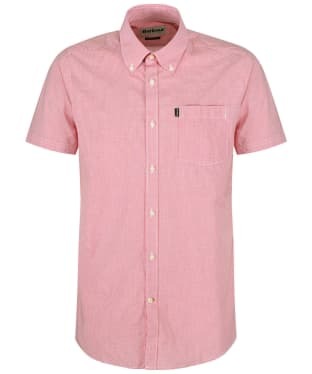 For a more formal look, the collar is button down, and there is a curved hem for a neat tucked in style. The men's Crew Clothing Lingfield Shirt is ideal for completing your casual look this season. 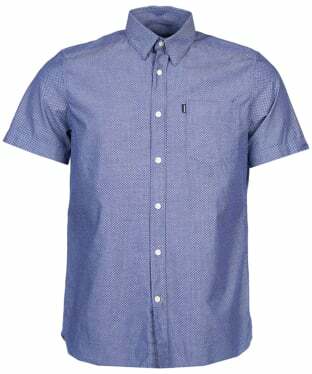 This stylish shirt boast a short sleeved design, finished with a stylish check which is perfect for teaming with jeans, shorts or chinos. The Lingfield will complete your look with ease as the days start to heat up, crafted from 100% cotton to offer added comfort and breathability. 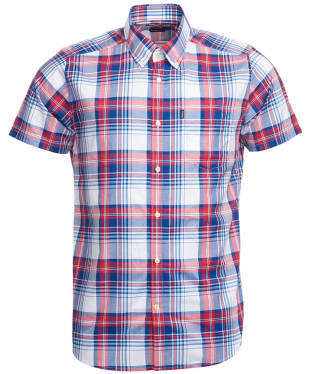 No wardrobe is complete without a soft cotton short sleeved shirt, and this Barbour Tenby Shirt will make the ideal addition to any summer outfit! 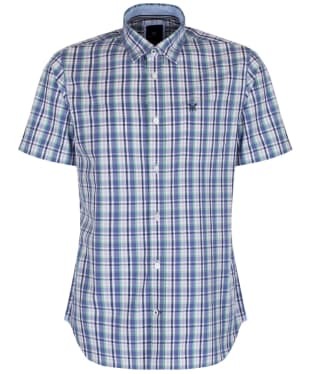 Available in this flattering, fine blue and white stripe design, the Barbour Tenby shirt is cut to a tailored fit, meaning it will offer a sleek and stylish silhouette without compromising on ease of movement. The Tenby shirt is finished with a simple patch pocket to the chest and a Barbour branded side tab. The Men's R.M. 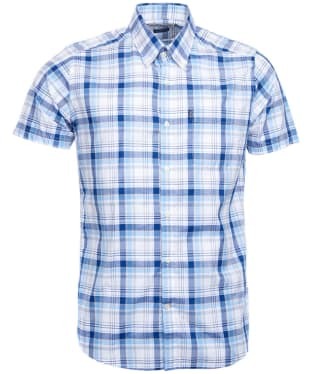 Williams Hervey Checked Shirt is perfect for those smart, casual days this summer and beyond. The Hervey has been crafted from 100% cotton to offer you an added comfort and breathability. For an added touch of comfort this shirt has been tailored to a regular fir and features side back tucks for extra movement around the shoulders. The all over check gives you an added touch of classic styling you are sure to love, finished with the R.M. Williams Longhorn embroidery for the mark of quality and style. 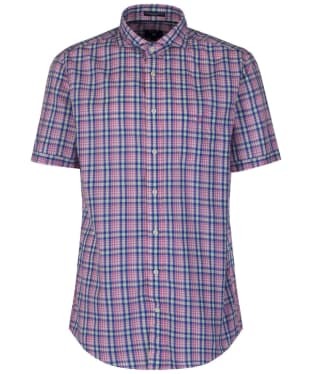 This short sleeved Barbour Elsdon shirt is ideal for the upcoming summer months. 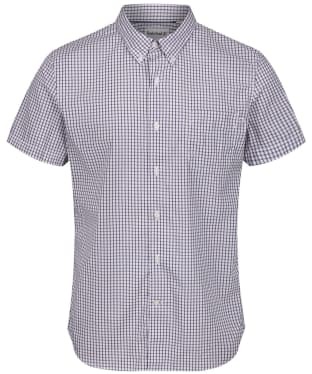 Made from 100% cotton for a comfortable fit, this lightweight shirt features a subtle pattern to give a little dimension. The cuffs have been turned up for a contemporary look, while the standard collar sits as a symbol of sophistication and impeccable Barbour tailoring. 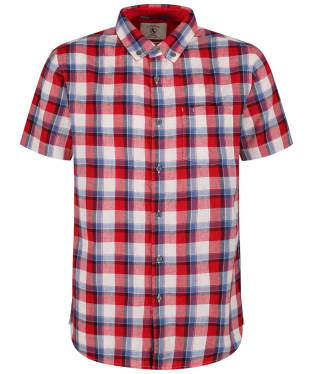 This versatile shirt can be worn alone, with layers or even open over a plain white tee fir the ultimate laid back look. 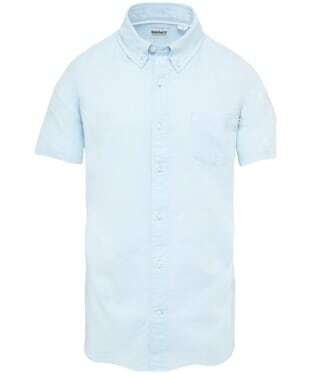 The Men's GANT Short-Sleeved Albatross Shirt is crafted in a cotton linen blend, perfect to keep you cool on warmer days. 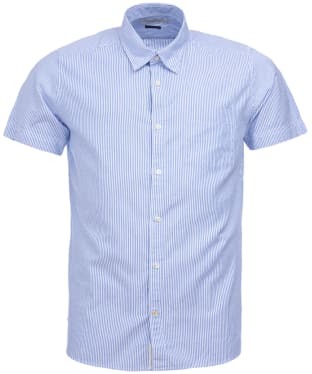 It's made in a regular fit, has a wide spread collar and rounded classic cuffs. Finished off with a tonal embroidered GANT shield on the chest pocket and locker loop detail to the back of the neck. 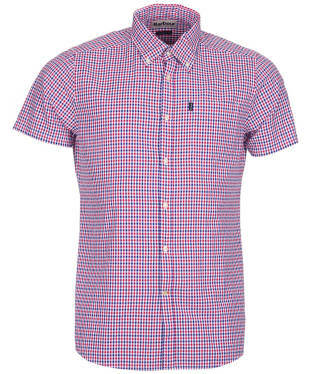 Available in two fresh colour ways, this shirt is perfect for brightening up your wardrobe this spring summer.